The W3A is an EN12094-3 approved, IP67 sealed outdoor call point designed for use with integrated gas extinguishing systems for the protection of high value assets. The plug and play design with special terminal block to facilitate first fix capability and high grade components is easy to install and provides the highest reliability. 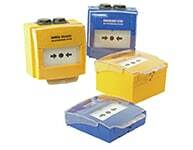 The unit has a hinged cover and glass element and is available in yellow and blue.